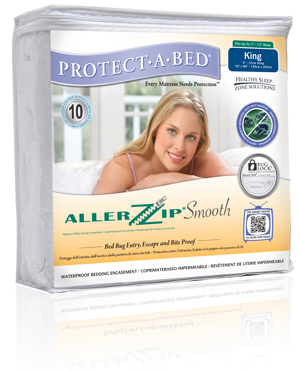 Keep bed bugs from infesting your mattress while increasing the ability to detect infestations. SBBS inspectors carry Protect-A -Bed encasements in their unmarked inspection vehicles. These encasements provide total impermeability against bed bugs. If you purchase an encasement from one of our inspectors, he or she will happily put it on your mattress or box-spring. Simply ask your inspector about how encasements can protect you against bed bug infestations. An added bonus is that by locking in allergens such as dust, dust mites, dead skin, pet dander and pollen. Protect-A-Bed’s Mattress Encasements are manufactured with leading technology in bed bug bite proof material. This material is known as the Miracle Membrane®. Every one of the encasements features a patented enclosure system that incorporates a sealed safety trench that is stitched around the typically vulnerable zipper clasp, as well as micro-zipper teeth for an extra tight seal. The scientifically proven system is known as bug lock . This locking mechanism is a major component to Protect-A-Bed’s success in providing complete protection against allergens, dust mites, and the prevention of the entry and escape of bed bugs.